Military thriller author Tom Clancy’s novel Debt of Honor made headlines back in 2001 because it ended with a commercial airliner used as a weapon in a massive terrorist attack on Washington D.C. The novel had been published 7 years earlier. The day of the September 11 attack, I remember running to the North Central High School library, checking out the book, and pointing out to my friends the passage describing the terrorist attacks. More recently, events have called to mind Clancy’s 1996 doorstopper follow-up, Executive Orders, in which Clancy hero Jack Ryan (Alec Baldwin, Harrison Ford, Ben Affleck, Chris Pine) finds himself thrust into the role of the president of the United States, where he must handle a slew of threats, foreign and domestic. - Extremists from neighboring countries take advantage of a power vacuum in Iraq, invading the country to form an Islamic state. The United States has to put together a coalition of Arab countries to repel them. - An armed attacker penetrates deep into the White House, exposing some embarrassing vulnerabilities on the part of the Secret Service. - The president celebrates the use of guided missiles as a crucial tool to assassinate Islamic extremists. - An ally of Iran helps “accidentally” shoot down a commercial airplane, killing hundreds. - A political rival files a lawsuit against the president, questioning the constitutionality of unilateral actions. - And of course, an Ebola outbreak hits America. Most of this, of course, is confirmation bias. 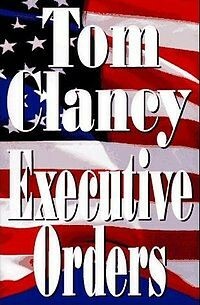 There are plenty of differences between Clancy’s novel and current events, starting with the fact that his President Jack Ryan is portrayed as much more conservative than Barack Obama, and with the fact Obama has not declared martial law or threatened the use of tactical nuclear weapons against his enemies. A couple of freak coincidental guesses doesn’t mean anything else in Clancy’s novels will come true. In his follow-up novel The Bear and the Dragon, for example, Clancy depicted large crowds of students in China taking advantage of the Internet to get past censorship and catalyze massive protests. And that’s just outlandish.